When Abraham’s servant met Rebekah, she was drawing water from the well. The shepherds of Nahor watered their flocks in the troughs adjacent to the well. Whether Rebekah intended to water Laban’s flock that day is less interesting than God’s interruption of her life. God chose Rebekah to be Isaac’s wife. He identified her exactly in the manner requested by Abraham’s servant: a young woman would give him a drink of water at the city well (Genesis 24:13-14). Why did God choose Rebekah and not one of the other women in Nahor? The Bible doesn’t say, but likely her background and character had something to do with His decision. At the time Abraham was seeking a wife for his son, Isaac was already a successful sheepherder. He owned thousands of small cattle (sheep and goats) and “continued to live as a nomadic herder, residing in a tent he inherited from his parents (Genesis 24:67) and wandering in the same circuit as his father.” Rebekah’s relatives were also herders, and she likely tended flocks as a young girl. Her older brother managed the family business, so it’s probable that Rebekah was a competent shepherdess at the time of her betrothal. Rebekah’s name means a “row of tied animals”  and reflects her pastoral heritage. “Milking in preindustrial societies was done by setting the ewes and does one opposite the other and tying them in pairs by a long rope, creating two long rows.” Perhaps Rebekah’s parents thought orderly rows of sheep a lovely sight because her name carries the additional meaning of captivatingly beautiful. Rebekah’s understanding of nomadic life, experience in tending sheep, and generous nature made her an ideal wife for Isaac. That they had an affectionate relationship and that Isaac took no other wives, handmaids or concubines speaks highly of their marriage. After marrying, Rebekah would have managed Isaac’s household. Instead of tending sheep, Rebekah would have dealt primarily with sheep products: wool, milk, meat and skins. “Dairy products constituted an important category of food in ancient Israel. Whenever possible, milk was drunk to quench thirst…and it was available in abundance for consumption and processing.” Like the wives of other sheepherders, Rebekah would have made yogurt, butter, curds, and dry cheese. She would have prepared lamb and game for special meals that included meat. Sheep were shorn once a year. “Shearing was an event that brought together many people who were engaged in controlling and shearing the animals, and like during the gathering of other crops, it was an occasion for great celebration (1Sam.25, 2 Sam 13:23-28) during which food and drinks were offered.” Likely Isaac, Rebekah, Isaac’s employees and their wives enjoyed the festivities at shearing time. Once the wool was cut, it had to be cleaned, spun into yarn and woven into fabric—activities that would have been familiar to Rebekah. Did Rebekah have doubts about marrying a man she’d never met? Did she regret leaving Nahor and all that was familiar? When her mother and brother asked her, “Will you go with this man?” she answered, “I will go.” The decision was Rebekah’s, and, for several reasons, I believe she left with confidence in the future. She expected to marry and become part of her husband’s life. 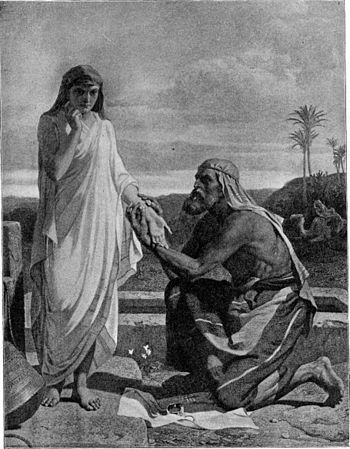 In Rebekah’s culture, parents arranged marriages for their children and formalized negotiations with gifts and pledges. Young women prepared themselves to become wives and mothers because the role of wife and mother was important, as her family acknowledged. “Our sister, may you become the mother of thousands of ten thousands; and may your descendants possess the gates of those who hate them” (Genesis 24:60). God brought Isaac and Rebekah together. He identified Rebekah in a word-by-word fulfillment of the servant’s prayer. Everyone immediately involved—the servant, Rebekah, her brother, mother and father—acknowledged that God orchestrated the match. “. . . The thing comes from the LORD; we cannot speak to you either bad or good Here is Rebekah before you, take her and go, and let her be your master’s son’s wife, as the LORD has spoken” (Genesis 24:50-51). presented by a wealthy suitor paid for the privilege of taking a valuable daughter from her family. The splendor of the gifts the suitor presented was a foretaste of what was in store for the bride. “Then the servant brought out jewelry of silver, jewelry of gold, and clothing, and gave them to Rebekah. He also gave precious things to her brother and to her mother” (Genesis 24: 52-53). Rebekah didn’t make the journey alone. She had a support group. Her traveling companions (her nurse and her maids) had shared her life in Nahor and would share her life in Canaan. “Then Rebekah and her maids arose, and they rode on the camels and followed the man” (Genesis 24: 61). Borowski, Oded, Every Living Thing, Alta Mira Press, 1998, p.44. Ibid., pp.53, 44; also Lockyer, Herbert, All the Women of the Bible, p.135. Borowski, Every Living Thing, p. 54. Posted in Abraham, Isaac, Laban, Marriage in ancient Israel, Rebekah, Sheep, Shepherdess, Uncategorized. Bookmark the permalink. Now Abraham was old, well advanced in age; and the LORD had blessed Abraham in all things. So Abraham said to the oldest servant of his house, who ruled over all that he had, “Please, put your hand under my thigh, and I will make you swear by the LORD, the God of heaven and the God of the earth, that you will not take a wife for my son from the daughters of the Canaanites, among whom I dwell; but you shall go to my country and to my family, and take a wife for my son Isaac” (Genesis 24:1-4). The old man had two gold bracelets and a ring, gifts for a woman he didn’t know. Camels accompanied him with food and gear for the journey and with many gifts. These were intended for people living somewhere in Haran where Terah had settled. Abraham insisted that his son marry someone from his own people and not a Canaanite woman. That’s why he sent his trusted servant to find a wife from Terah’s family (Gen. 22:20-24). Abraham believed the servant would find a bride in Haran because God “will send His angel with you and prosper your way” (Gen. 24:40). So, the old gentleman was on a mission of faith—Abraham’s faith. When Eliezer arrived in Mesopotamia, he stopped at the well of Nahor where Terah’s people lived. The old man prayed for immediate success in finding the right woman for Isaac. He asked that she be identified by three signs: she would come to the well for water; when he asked her for a drink she would give it to him; and she would offer to water the camels. 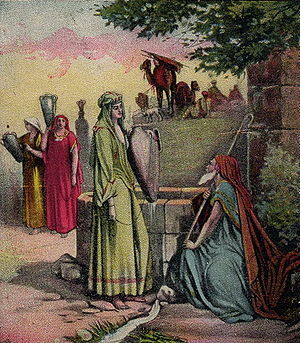 Immediately, beautiful Rebekah appeared at the well, filled her pitcher, gave him a drink and drew water for the camels. If that were not enough reason for joy, Rebekah said she was related to Abraham’s brother Nahor. Out came the bracelets and the nose ring. Eliezer knew she was the answer to prayer. God had divinely singled out Rebekah as the young woman intended for Isaac. So he “put the nose ring on her nose and the bracelets on her wrists…and worshipped the LORD” (Gen. 24:47-48). In bestowing the jewelry, Eliezer claimed Rebekah for Isaac. In accepting the jewelry, she allowed Eliezer to touch her wrists and face—she was willing to proceed. She “ran and told her mother’s household these things” (Gen. 24:28). Rebekah’s appearing before them wearing bracelets and nose ring opened the way for Eliezer to meet her family and propose marriage. After hearing the servant’s remarkable story, Rebekah’s father and brother agreed that this “comes from the LORD…let her be your master’s son’s wife, as the LORD has spoken” (Gen. 24:50-51). Was she committed at this point? Not yet, although everyone began eating, drinking, and acting as if she were. Because the talks had been favorable, Eliezer presented mohar, a gift from the family of the groom to the parents of the bride. It was traditionally given to the bride’s father when the parents gave their consent to the marriage. Mohar could be in the form of money, land, jewelry, clothing or something “precious” (Gen. 24:53). Mohar had somewhat a feeling of being compulsory and expressed the legal aspects of an arranged marriage. It was thought to compensate the bride’s family for her loss. Some fathers kept their daughter’s mohar as insurance in case she was widowed or divorced. 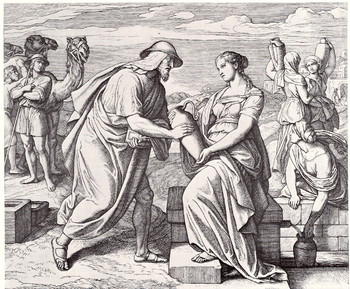 In Rebekah’s case, Eliezer gave precious things to her brother Laban and to her mother. The Bible does not mention why Bethuel, the father, did not receive mohar, although he did give permission for the marriage (Gen.24:50). Arrangements had come together quickly. Eliezer gave Rebekah special gifts from the groom to the bride called mattan. Mattan could be cash or property or something of a personal nature, “jewelry of silver, jewelry of gold, and clothing” (Gen. 24:53). Mattan was a voluntary assurance of the groom’s personal interest in his bride. Isaac was a wealthy man (Gen. 24:34-36) and his mattan must have been sumptuous—purple linens, exquisite jewelry, embroidered fabrics, gold and silver ornaments, fragrances—everything to delight Rebekah’s heart. Was she committed to marriage now that mattan had been given? Not quite. The parental arrangements for marriage and the exchange of gifts may give the impression that men in Abraham’s time could buy their wives. If a man proposed and gave gifts to a girl’s father, did she have any say in the matter? Daughters and sons were very much under the authority of their fathers. Jewish practices, however, made it clear that a wife had to consent to be married. “The opinion that Israelites were required to buy their wives from the parents or relatives seems unfounded.” Rebekah was finally asked for her consent when Eliezer packed up for the return trip. Eliezer: Since the LORD has prospered my way; send me away so that I may go to my master. Family: We will call the young woman and ask her personally…will you go with this man? A final round of gift-giving occurred when Rebekah departed. The family allowed Rebekah’s nurse and maids to leave Haran and serve her in Isaac’s household. Her nurse and maids became a parting gift, shilichin, (something given by the family to a beloved daughter leaving home). Not every man could afford the investment Isaac made in procuring a wife. “It would undoubtedly be expected that the mohar should be proportioned to the position of the bride and that a poor man could not on that account afford to marry a rich wife (I Sam. 18:23). Isaac and Rebekah’s son Jacob, for example, paid his Uncle Laban in work for the privilege of marrying Rachel. The relationship between the two men got off to a bad start because of Laban’s deceit, and it didn’t improve over the years. When Jacob separated his family from Laban’s family, there was no shilichin, no happy parting gifts. Posted in Abraham, Bible women, dowry, Eliezer, Elijah, Faith, Handmaid, Isaac, Laban, Marriage in ancient Israel, Mattan, Mohar, Rebekah, Shilichin, Terah, Uncategorized. Bookmark the permalink.